Here's Buck Childers' original plan, as found on the Kite Plan Base, along with a few similar designs. He called it a "Ram Air Pocket Sled", but most people just shorten the name to "pocket sled". 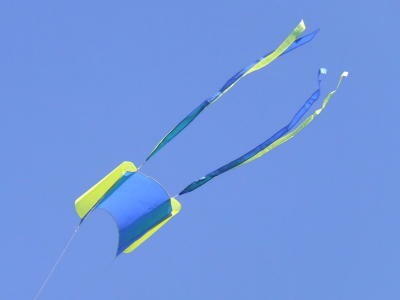 It's very much like a regular sled kite except that instead of using two or three longeron sticks, the scoop pockets (open at the trailing edge) provide the rigidity, similar to a flowform or parafoil. 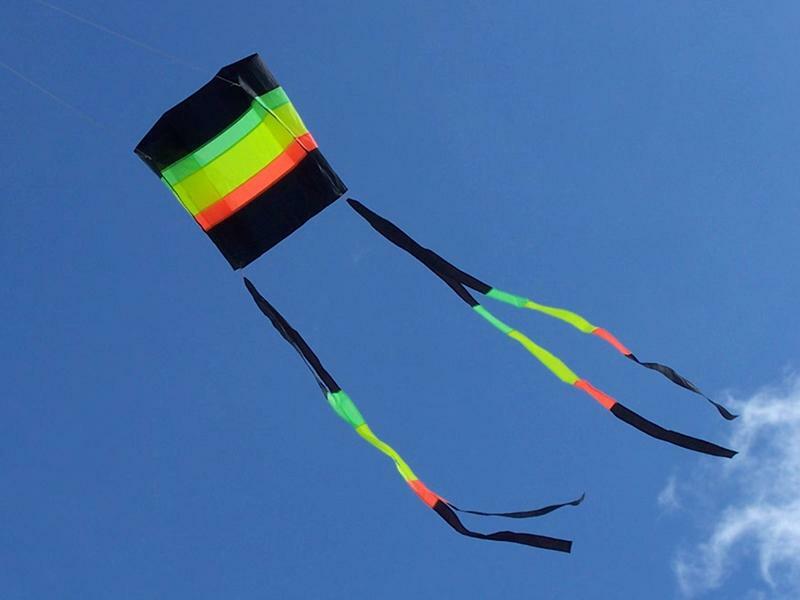 The beauty of this kite is that the kite, tails, and flying line can all scrunch into a small bag which could be carried in a backpack or glove compartment. I made all of these with 0.75 oz. ripstop nylon, but there's no reason why you couldn't make them out of Tyvek, plastic drop-sheet, and so on. The directions say that it can be scaled up to 2 times larger before it needs battens, but I'm not sure if that means twice the area or twice the length and height (which would be 4 times the area). For a similar but larger kite, see The Royal 69 Sled at the Kite Plan Base. Something that is important to note about that drawing is that the 9 cm dimension between the top of the main panel and the dotted line does not mean that the dotted line on the pocket cell is also 9 cm from the top. The dotted line on the cell panel is meant only to indicate the width. Once I got the posterboard template cut out, I discovered that one edge of the scoop panel would not align with where it's supposed to be sewn onto the main panel. Evidently, I'm not the first to have problems with the plans. 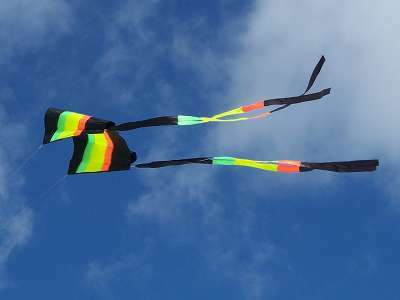 See this kitebuilder.com discussion thread. 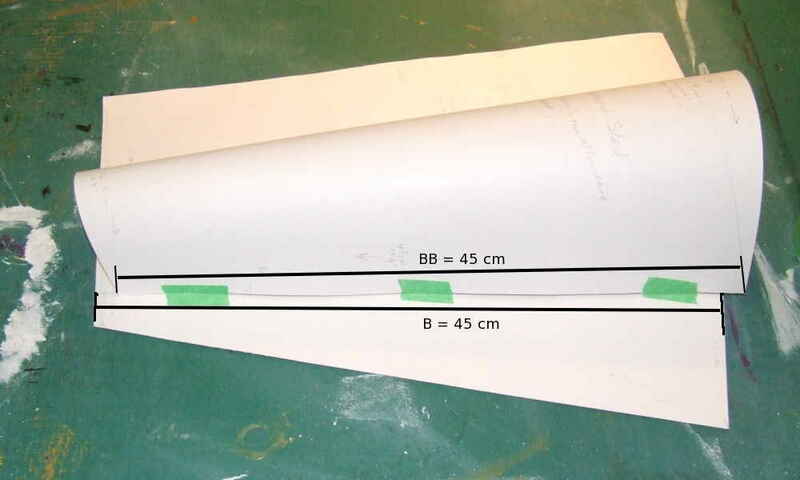 In my case, the top end of the edge of the scoop panel indicated as "BB" on the plan ends up 15 mm forward of the leading edge, and the bottom end is 15 mm forward of the trailing edge. If I bend the scoop panel to line up at the leading edge, it forces the scoop to be too narrow at the exit (trailing end) opening and it does not even reach the trailing edge. The main panel template shown here is only half width. It would normally be placed and cut out on a fold of the fabric. *several days later* I finally figured out that if you force the edges to line up, the only distortion that occurs is that one corner lifts up, which puts a slight twist in the scoop. This is no different from sewing up the last seam in a spinsock. So, instead of modifying the plan, I went ahead and cut the panels exactly according to the original plan, with extra where I needed seam and hem allowances. I think I'll make a second template with seam and hem allowances included, which will speed up production. Oh, by the way, you cannot use the "burrito roll" technique to keep all the fabric edges for the scoops on the inside, as you can with a flowform. This is because you can only use that where there are all edges to sew together, not edges to a flat face. As a result, I had to sacrifice 1/4" of one fabric along one side of the scoop panels, so that I could fold the edge under when I sewed it down. It doesn't affect the performance significantly. I decided to make a pair of transition tails for this one, simply because I had never made any before. Here's how they look half-way through construction. 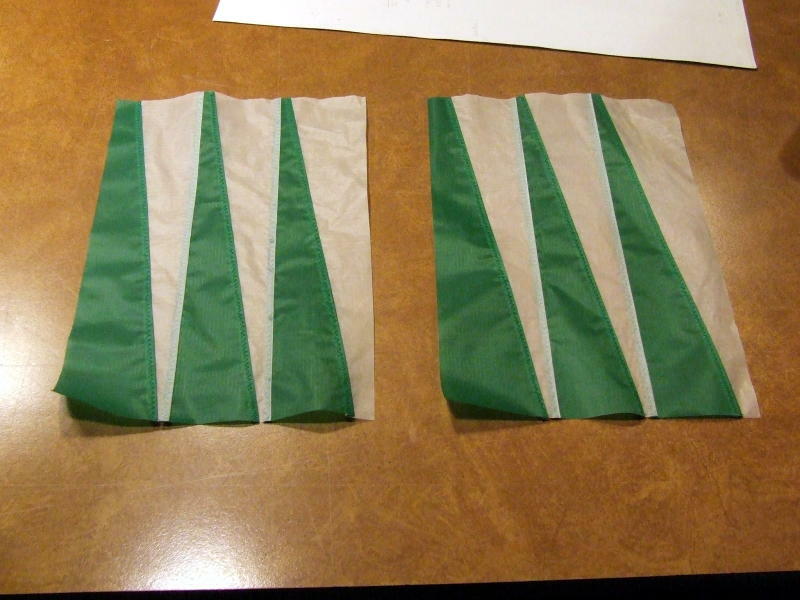 Both the original white and the green rectangles were cut to 12"x9" (30.5 cm x 23.9 cm). The next step is to cut both pieces horizontally into six strips, and then sew those strips end-to end. After I got the short pieces together, I add a few inches of white to the front and green to the end, mostly to make up for the fact that one ended up a bit longer, probably because I just guessed at the seam overlaps. They came out to about 1.5 meters long. I gave them a single-fold hem because a hot-cut edge on ripstop nylon can give you a nasty cut if you run your fingers along it. April 8, 2010: The green pocket sled is done. It does indeed fly. Later that day I took it out to a large flat field for some further testing. The wind had dropped to about 4-6 km/h (at ground level) and it still flew nice and steady on 50 m of line. At about 5 km/h and lower, I had to pump it a bit to launch it, but eventually it would catch the wind and rise up. It didn't wiggle as much as I thought it would. - April 23, 2010: I finished this pink and black one last night (using a new template) and had a lovely day to test-fly it today. The wind was a bit on the strong side, 20-25 km/h in mid afternoon, some gusts to 29 or so. It was a bit tricky to launch because it wouldn't inflate easily, and I had to do a long launch. Once it did inflate though, it went right up. It tended to lean to the right in gusts, and would occasionally do a strange little thing where it would suddenly fold up and then open up again right away. Later on the wind settled down to about 15-18 km/h, and it behaved much better. It also does well with no tails. The biggest difference with this one is that I remembered that I needed 1/4" more seam allowance for the lower seams on the scoop panels. The tails are 50 mm wide flat strips of ripstop nylon, about 1.5 m long, hemmed with a single fold. Some time later, in May and June: I got three more done. 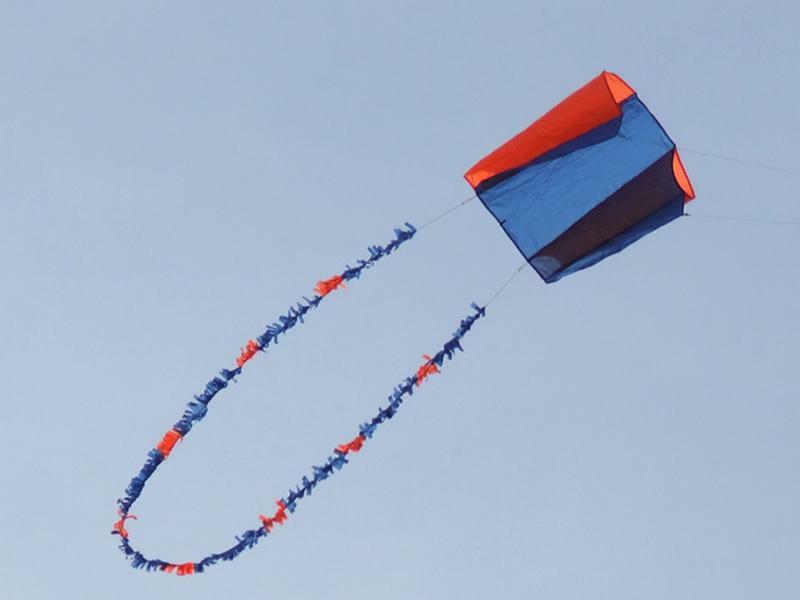 July: Once I got the winders and flying line that I ordered, I put them all in their bags and gave them to the kids of some family and friends. Now I have to make some for myself because they fly very well. On Canada Day I was at Fort Beausejour and the wind was quite strong and gusty. My FF04A and Dunton Taylor had trouble, but the green and yellow pocket sleds went up and stayed up all day. As mentioned earlier, they do well in low wind too. The only time I've had trouble with them was in a valley surrounded by trees, and when there was any wind, it kept changing direction. 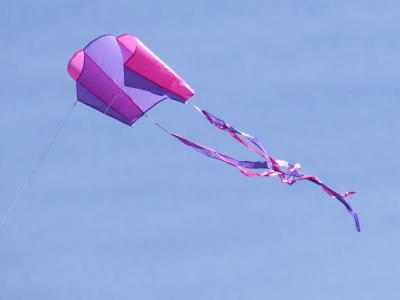 I doubt there is any kite that would have worked. 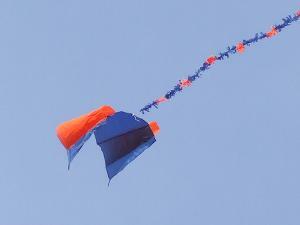 I have learned something about young kids and kites. They have a completely different notion of what kites are for. I like to launch them, anchor them, and watch them at my leisure as they fly themselves. 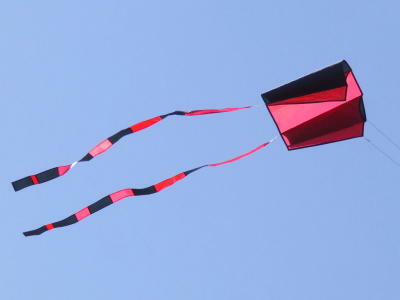 If you have to run with a kite, then you're doing it wrong, or you have the wrong kind of kite. Not so with kids. Their idea is that kites are for pulling behind you while you run, and that they (not the wind) are what make the kites fly. That is partly why I chose separate ribbon tails, and not "U" tails that go from one side to the other. 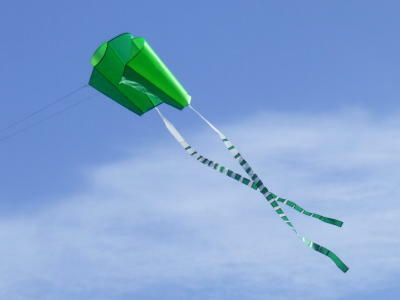 Those might snag on something on the ground or in a tree, especially if the running kid is not watching the kite. When I was coaching of of the kids in launching her pocket sled in a postage-stamp-sized back yard, I found that you could lay it (the kite, not the kid) down on the ground on its back, with the tails underneath and trailing backwards. Then I put a pair of "flip-flop" sandals on the trailing edge next to the tail tie points. She had about six feet of line out, plus the bridles. 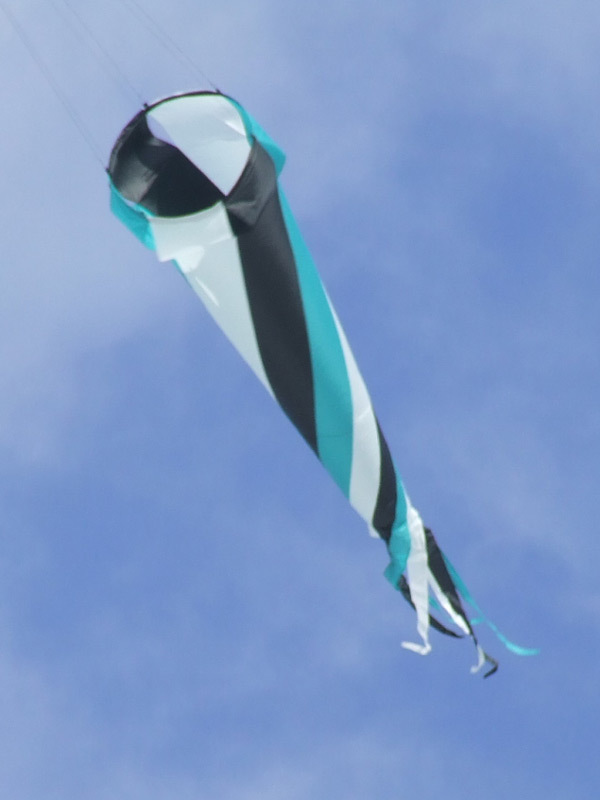 When she took off running the leading edge of the kite would come up, and then it would inflate nicely and take off. This worked about 9 times out of 10, which is a good success rate for a solo launch. Any smooth compact object with a bit of weight to it would work; two handfuls of sand or snow, a pair of pebbles, beanbags, anything that is not likely to blow away by itself nor get tangled in the tails or bridle lines. View from the rear. It was still a bit wrinkled from storage, but it inflated well enough anyway. April 2, 2011- I've decided that the fuzzy tail is a bit too prone to geting tangled in the bridle during launches, so I'm going to make a pair of standard ribbon tails. Another one, by special request, for Sue's birthday! 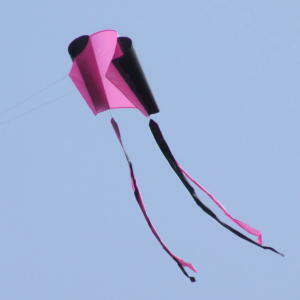 Photos taken April 3, 2011, but the kite was finished March 22, in time for Sue's birthday on the 23rd. The tails and bag weren't done until April 1. The colours are black, hot green, hot yellow, and hot orange. his is the first one that I've made with different colours in the three main panels. I used sort of a flat-fell seam to join the colours. There's a bit of snow on the ground, so the underside lights up nicely. 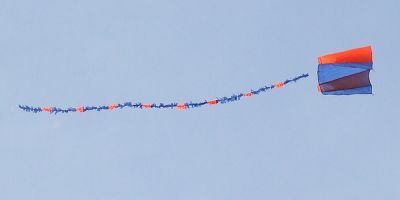 You can find additional discussion, construction tips, and anecdotes about the pocket sled on the kitebuilder.com forum. My First Pocket Sled - actually, it was that forum member's first kite that they had made out of ripstop nylon. It had straight edges all around, which is somewhat easier to sew. Pocket Sled LE Problems - gusty high wind, soft fabric. Ms Edginia Edgebinder - photos and dispatches from abroad posted by the globetrotting Edginia, with her custom-made pocket sled for a travel vehicle.